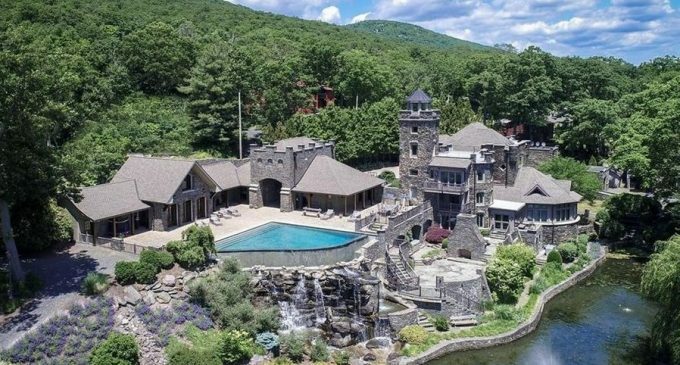 A historic castle with 700 feet of shoreline on Greenwood Lake and a history going back as far as 1915 has hit the market for $14,750,000. It’s known as Tiedemann Castle and belongs to former professional baseball player Derek Jeter. The storied estate had been at one point the childhood home of Jeter’s grandfather, William ‘Sonny’ Connors. It was built in the early 1900s by Rudolph H.E. Gudewill for his wife Fanny. Following Gudewill’s death in 1946, the castle was sold to John and Julia Tiedemann, who adopted William ‘Sonny’ Connors in the 1950s. It’s reported that Jeter purchased the estate in 2003 for $425,000 before embarking on an extensive renovation of the historic property. Today, Tiedemann Castle offers over 12,500 square feet of space with 6 bedrooms, 12 bathrooms, turrets, a widow’s walk and views over Greenwood Lake. The estate spans 4 acres and is made up of two parcels, including a main house, guest house, pool house, boat house and much more. The property also includes extensive gardens, a lagoon and infinity edge swimming pool with massive rock waterfall. This one-of-a-kind property is on the market for $14,750,000 with Diane Mitchell. For more information on Tiedemann Castle, visit Dupont Castle.